Mark Waid starts the search for a new Champion! Fresh off the events of the “Words Collide” story arc, the Champions sit reeling after the heartbreaking loss of a team member. But the group’s decided to honor the memory of their fallen comrade by making sure to stay strong for the sake of the world they swore to protect. To keep their foothold in the fight for good, they’ll need some help…and in CHAMPIONS #16, the search for a new teammate begins. On January 17, writer Mark Waid and artist Humberto Ramos put a few hopefuls to the test in part one of “Champion for a Day”! We spoke with Waid to hear more about what to expect. Marvel.com: Catch us up on what went down in the “Worlds Collide” arc! Mark Waid: The Avengers and the Champions teamed up for a mission to save two worlds and, after some trials and tribulation, they succeeded. But the victory came at a terrible cost: Viv Vision disappeared before their eyes, believed dead. Marvel.com: So how do the Champs pick up the pieces in issue #16? Mark Waid: No one on the team is quite sure what’s up and what’s down all of a sudden. Feels kick in hard, but so does the realization that the team needs more power if they’re going to survive. 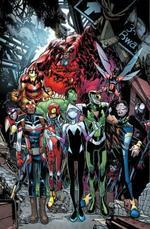 Marvel.com: What qualities will the team be looking for in potential recruits? Marvel.com: Who’s lining up for auditions? Mark Waid: Among others—the new Patriot, Moon Girl and Devil Dinosaur, Red Locust, Ironheart, and a few surprises! Marvel.com: How did you enjoy writing the candidates’ interactions with the Champions? Mark Waid: Ironheart and Cho-Hulk have a very unique way of communicating with one another that’s ended up being the most fun I’ve had writing in quite a while. Marvel.com: What proved to be the most difficult part about bringing this story together after such an intense arc? Mark Waid: It’s always been a tough balancing act to juggle drama and comedy in this book, but with an art team like the one I’m blessed with? They pull it off beautifully. Marvel.com: Favorite moment to write in issue #16? Mark Waid: Miles Morales explaining who he wants on the team. 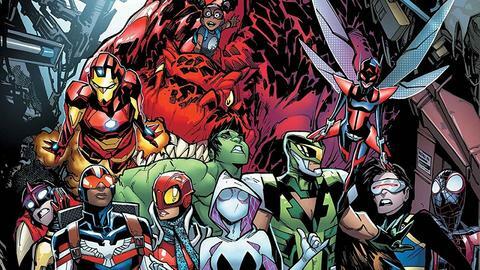 Marvel.com: Last question: What would the Champions say if you showed up to a recruiting drive? Assess the new recruits in CHAMPIONS #16, by Mark Waid and artist Humberto Ramos, on January 17!